Through her incomparable work on screen, stage, record, radio, and television, Judy Garland earned renown as The World's Greatest Entertainer. It was as a motion picturestar though, that she first rose to international fame. Fromher feature film debut in 1936 through the aptly titled "I Could Go on Singing" in 1963, she lit upthe screen with a magic uniquely hers and dazzled world-wide audiences of all ages.Judy Garlandstarred intwodozenof the all-time classic movie musicals, among them "A Star is Born," "Meet Me in St. Louis," "Babes in Arms"," "" Easter Parade," "For Me and My Gal," and "The Harvey Girls." Her dramaticturns in "Judgment at Nuremberg," "The Clock," and "A Child is Waiting" won addedacclaim. And perhaps most unforgettably, she starred as Dorothy Gale in the best-loved motion picture of all time: "The Wizard of Oz. ""Judy: A Legendary Film Career"tells the story of Garland's movie workin unprecedented detail. Hundreds of never-before-published photos, newly-assembled contemporary reviews, insight from her costars and coworkers, and production histories are provided for each film in which she appeared. Highlighting and complimenting the feature films is a definitive biography;an examinationofJudy's short subjects; details of the movies she did not complete; and an enthrallingcompendium of film projects for which she was considered or rumored. The text is illustrated by more than five hundred photos, encompassing poster art; costume tests; behind-the-scenes candids; onstage and backstage glimpses of her theatrical successes; and personal snapshots. "Judy"is the exhaustively researched work of historian John Fricke. Hecelebrates as never before the heart, humor, and incandescent motion picture achievement of the one-and-only Judy Garland. John Fricke is a two-time Emmy(R) Award winner for his work as co-producer on the PBS American Masters and A&E Biography documentaries on Judy Garland. He is also a Grammy nominee for his essay accompanying the music CD Judy Garland: 25th Anniversary Retrospective. His credits as author include The Wizard of Oz: An Illustrated Companion to the Timeless Movie Classic. John lives in New York City. "...A wonderful book...enhanced by a comprehensive text that includes thoughtful insights from her many co-stars and coworkers. … [with] more than 600 photographs from her remarkable career, including many never seen before." 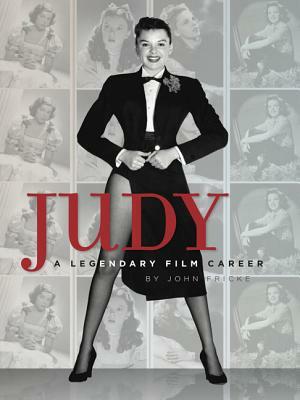 "a glorious coffee-table...a glossy, gorgeous tribute, packed with hundreds of never-before-seen photos of the star — portraits, costume tests, on-set candids"
"Once you pick up the handsome, oversized hardcover volume Judy: A Legendary Film Career by John Fricke (Running Press) you’ll find it difficult to put down. No one knows more about Garland than Fricke, who provides an eye-popping selection of rarely-seen photos (as well as posters, sheet music, and other ephemera) to accompany his film-by-film survey, along with an overview of Judy’s radio, TV, and concert work. Additional chapters deal with unrealized and rumored projects over the years. What a beautiful bouquet to a great performer." “…Fricke's volume brings us never-before-published photos, commentary, and the most complete tribute available to one of the world's best loved stars. Highly recommended for Judy Garland fans."